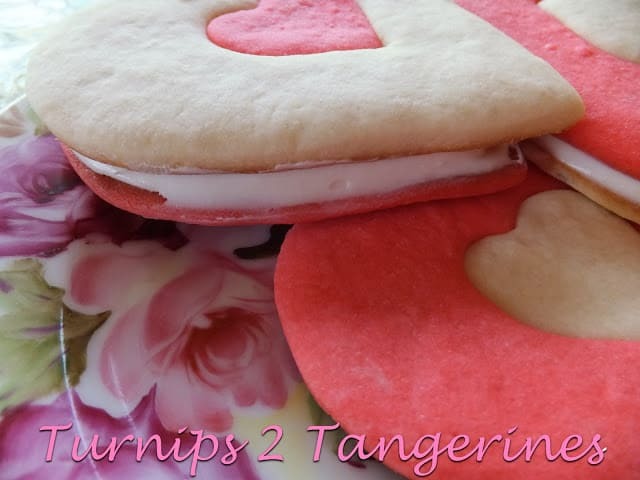 Valentine Sandwich Cookies with Peppermint Frosting Filling are the perfect cookies to serve your sweetie on Valentine’s Day. This cookie dough is basically a sugar cookie dough with the volume turned up. The dough is divide in half and one half is tinted with red food coloring. The half with the added food coloring also has peppermint extract added to it that gives it a nice minty flavor that isn’t overpowering. 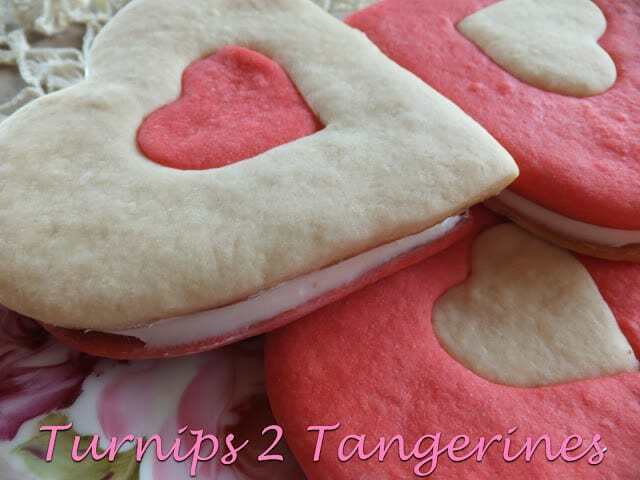 Valentine sandwich cookies are two-toned cookies with a delicious twist. Instead of frosting the cookies with a cool mint frosting, the cookies are ‘filled’ with the peppermint frosting. That’s right! After the cookies are baked and allowed to cool. The cookies are then turned over and a thin or thick layer of frosting is spread on the flat side. The two cookies are pressed together and the frosting becomes the filling! 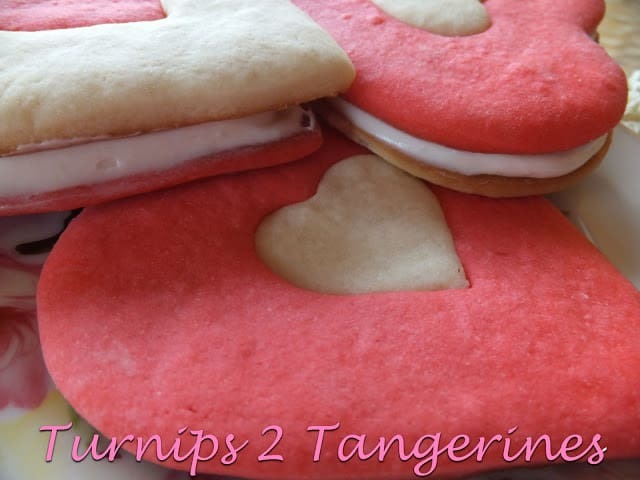 A delicious and minty sugar cookie with Valentine appeal. In a large bowl, combine 1 cup sugar, butter, milk, vanilla and egg; blend well. Lightly spoon flour into a measuring cup; level off. Add flour, baking powder and salt to sugar mixture, mix well. Divide dough in half; refrigerate one half, covered. To the other half of dough, add 1/2 teaspoon peppermint extract and red food color to desired color. Refrigerate at least 1 hour for easier handling. On lightly floured surface, roll 1/3 of white dough to 1/8 inch thickness. Cut with floured 2-1/2 inch heart shaped cookie cutter. Place 1 inch apart on ungreased cookie sheet. Repeat with 1/3 of pink dough. 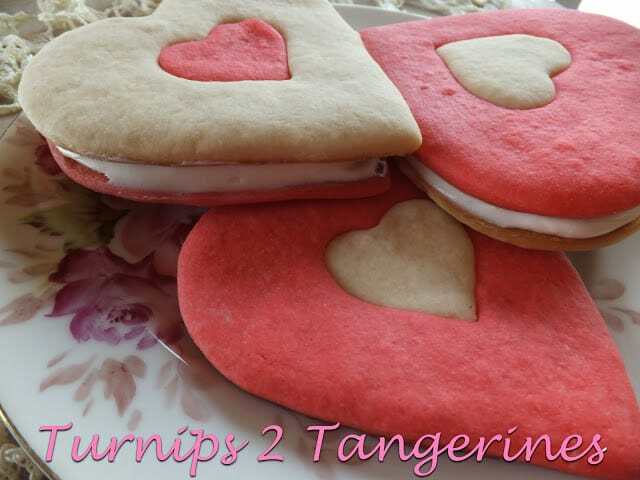 Using floured 1-inch heart shaped cookie cutter, cut center from each pink and white cookie. Remove centers, replace each center in cookie of opposite colored dough. Repeat with remaining dough. Bake at 400º for 5 to 9 minutes or until edges are light golden brown. Cool 1 minute; remove from cookie sheets. Cool on wire rack. With electric mixer cream butter, cream cheese and peppermint extract. Add powdered sugar, one cup at a time, beating well after each addition. Add milk as needed. Mix until light and fluffy. Make Valentine’s Day even more special and serve any one of these satisfying and festive Valentine treats; Valentine Chocolate Chip Cookies, Pink Strawberry Rosette Meringue Cookies, Valentine Popcorn Balls and Cream Filled Valentine Funfetti Cupcakes. Such pretty cookies! Thank you for sharing them at Wicked Good Wednesdays! Thank you!! So Glad you dropped by! These cookies look so yummy & cute! They look really good! New GFC follower and FB liker. Stopping by from the GYB hop. What pretty cookies! I wish I had one right now – I am craving something sweet! I found your blog from the GYB blog hop. I am now following you! I look forward to seeing what else you are cooking! Those are to die for! I am your new follower. Thank you stopping by and following!